She’s the friendly, empathetic voice on the other end of the line. The stories she hears are not all new to her, either. It was after her friend escaped an abusive relationship that Ellis of Sammamish decided to dedicate a few hours every week to LifeWire. Now, after hearing from the women (and also some men) who call in – she’s determined to stay on the line for those in need. When there’s a call for help, she answers. Feeling at fault: (People who have been victimized often ask) “How did I let this happen?” And they take a sense of fault. “Once he hit me the first time, I should have left,” but you don’t, and then what do you do? So, that’s what I think is hard. It’s a cycle. It’s just a really vicious cycle. Emphasis on empathy: There’s still so much shame around (domestic violence). So, many people who haven’t experienced it, or (haven’t) known somebody who’s experienced it, think, “Oh, that will never happen to me.” Or, “I would never put up with that.” Or, “I would never let someone else do that to my sister, or my daughter, or my mother.” But it’s a lot harder. Under control: If you don’t have any money, or even if you have money, your credit could be ruined. If you have bad credit, you can’t get an apartment, you can’t get a car, a lot of times (callers) may not have work experience because they’ve been forced to stay home. I’ve talked to women who have called from a friend’s phone because they’re not even allowed to have a phone. Investing in survivors: We get calls from people saying, “My battery on my car just died, and if I can’t get to work, I’m going to lose my job, which means I’m going to lose my house, which means I’m going to lose my kids.” So, sometimes, LifeWire will help pay for a new battery because it’s not so much $100 for a battery, but a $100 investment in keeping her in her house, with her kids in school, in a safe place. For us, $100 (can be a lifeline) for somebody else. The scariest cases: (I talked to) a woman. Her partner had tried to kill her and her four children. So she was fleeing and was in a hotel, and the police were looking for him. She had a house; the kids were in school but she couldn’t go back home until he was caught. That was a – “OK; they need help right now.” So, we were able to pay for a hotel for three days for them to just stay in hiding until the police could hopefully find him. That was a hard call. She was just going through all of this, so there were a lot of emotions, a lot of crying. In that particular one, I said, “I’m not going anywhere. Take your time. Take a breath. I’m here.” That’s what I want to provide. I don’t do the advocacy stuff as far as the housing. I just want to be the person who can empathize and believe them and see what we can do to help them. Lack of funding: There are a lot of calls for shelters. 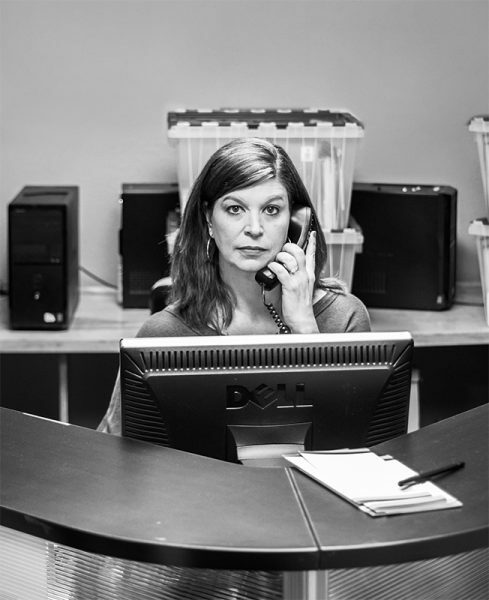 Last year on the Eastside alone, just within LifeWire, we received 11,000 phone calls for assistance. Out of that, we could only help 4,000. We just don’t have the resources; we don’t have the funding. Knowledge is key: We do get grants, but I would say about 50 percent of our funding is from private donations, and so that’s really important. But until people really start talking about (domestic violence) and understanding it, a lot of people think, “I don’t want to donate because they put themselves in that situation.” I’ve had these conversations with people, and it drives me crazy. Broad affect: There’s no stereotypical person. It does affect all social statuses. The downside: The worst part of my job is when I can’t help somebody, and I have to turn him or her away. Talking to her kids: I just want them to know these things go on. If it’s not you, it could be a friend, so just keep aware. Keep your eyes open to all of it. What can seem innocent, a “that’s just how he is” kind of thing — sometimes it’s more than that. Advice for the public: Keep their eyes open to what’s going on around them. We do that for car prowlers, or for our neighbors when they’re away. We look out for people’s things, but I don’t know if we necessarily look out for people. Giving time: I’m lucky enough that I have the time to be able to volunteer. It’s my job. I know enough now that I feel like I can help the way I really want to help. To quit now would be … it’s just not an option. The power of volunteering: Each person makes a difference, and if we all just even gave two hours a week to any charity, not necessarily this one, just what a difference I think it would make.